These 3" diameter quality wax floating candles are crafted by Armadilla Wax and are the designers' choice for simplicity, beatury and price. Floating candle centerpieces are naturally beautiful - the water reflects your accents in and around the containers and our candles will burn the length of your special event. 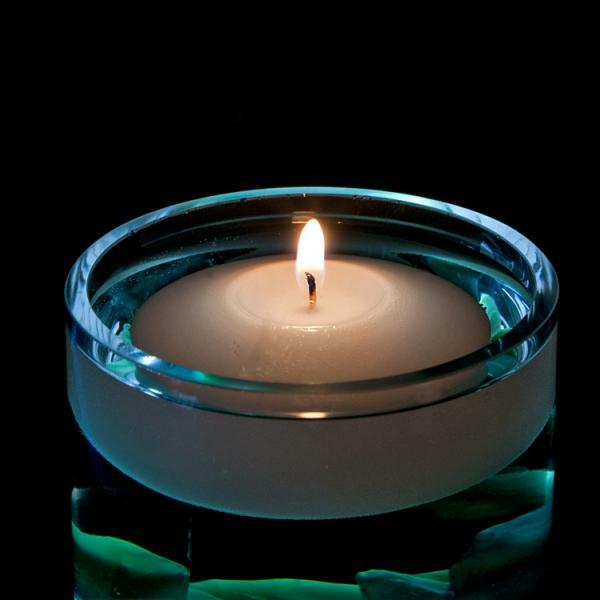 Pinch the wick, gently lower the candle into the water - light and enjoy! The flames are centered in the candle. At the end of the evening just pour out the container of water and the candles will flow out with the water. Your container can be used again and again. Party is outside? Lower the water level in your cylinder or container a few inches below the top so the candle flame is protected from gentle breezes.